Lynn Creek Park is a day use facility that is open from March through September. 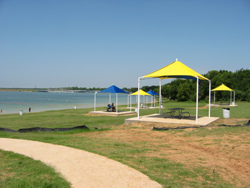 The park is managed by the city of Grand Prairie. Lynn Creek is located along the northwest corner of Joe Pool Lake and is accessed from Lake Ridge Parkway (driving directions). Within the park's 785 acres you can find a swimming area with a beach, a playground, a concession stand, two boat ramps, group and single use picnic sites, and a sand volleyball court (Lynn Creek Park map). Lynn Creek Park annually hosts the holiday light display "Prairie Lights." The event begins after Thanksgiving and runs through New Year's Eve. There is a per car entry fee, with a maximum of 6 people per vehicle. Fees vary according to the day of the week and if you are a resident of Grand Junction. You must also pay a fee to use the boatlaunch. Lynn Creek Park is open 6 a.m. to 10 p.m. daily from March through September. Residents of Grand Prairie (shown through showing a valid driver's license with a Grand Prairie address) can enter the park for free on some days, with some stipulations. Free entry is only good for one vehicle with up to six people and this offer is not valid during holidays and special park events. Fees also apply if you are towing a trailer. The swimming area has a nice sandy beach. There is also a grassy section that a some covered picnic tables. Adjacent to the beach/swimming-area there are a playground, restrooms, changing rooms, and a concession stand. The park contains close to 100 picnic tables. Some tables are covered, sit on a concrete pad, and have a waist high barbeque grill just off one edge of the concrete. Many of these sites have a pull up parking place with room for two cars. Other tables have no grill, no concrete pad, and are shaded by trees. These tables are typically walk up sites and are located near the parking areas. Lynn Creek Park has two pavilions where you can have a picnic with a larger group. They pavilion itself is a larger covered area that protects a number of picnic tables. There is also a large barbeque grill off to one side of the pavilion. The smaller site has six picnic tables and is located next to the main parking lot. The beach, and its facilities (restrooms, changing rooms, concession stand, and playground) are also close at hand. The second group pavilion is slightly larger, with eight picnic tables, and is in a more secluded wooded area. There is a parking area and restroom facility specifically for this group picnic site. The beach and all of its facilities are just a short walk away. Pavilions rental fees vary by the day of the week and if there is a holiday. The per vehicle entrance fee still must be paid to enter the park. 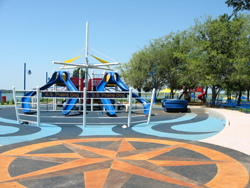 There is a playground located near the beach/swimming area, a sand volleyball court, and open grassy areas. This website is not affiliated with Lynn Creek Park, park management or the City of Grand Prairie. You can find more details about fees and other information at the Grand Prairie Lynn Creek Park website. 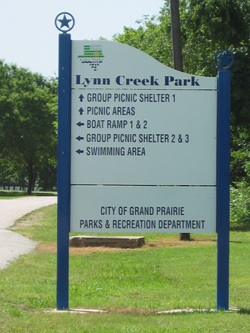 Lynn Creek Park is located off of Lake Ridge Parkway (Grand Prairie, Texas).